We’ve definitely noticed a shift in the weather and the light over the last few weeks. It’s ever so chillier at night now, and night itself has been arriving earlier and earlier. Accordingly, our evening feedings have been getting pushed a bit earlier every day to avoid going out in the dark. Morning chores are so much more pleasant these days; we’ve even been wearing sweatshirts or flannels out! 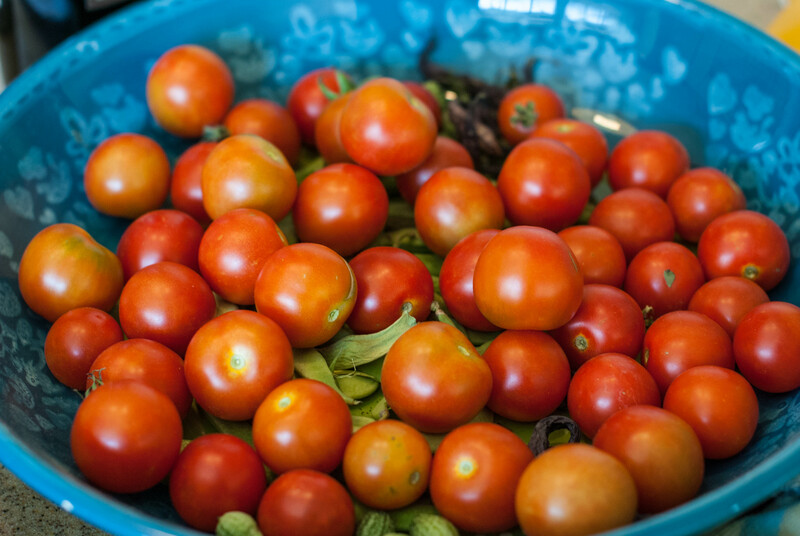 Even so, the garden continues to churn out summer’s leftover bounty in the form of cherry tomatoes and raspberries. 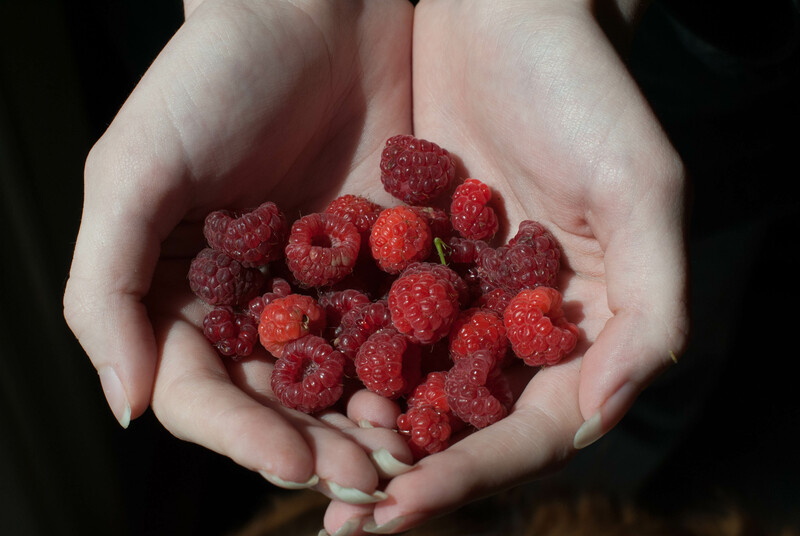 We’re getting a nice bowl full of raspberries every day. This is from a raspberry plant I bought two years ago at Lowe’s (basically it was a stalk at that point!). We’ve decided we’ll put another stalk in at the opposite end of the garden and let them grow towards each other. I’ve also been getting bucket loads of cherry tomatoes. The craziest part is that I didn’t end up planting cherry tomatoes this year. These are volunteers from years past. I think the main factor in their success, though, is that these are located fairly close to the beehives. 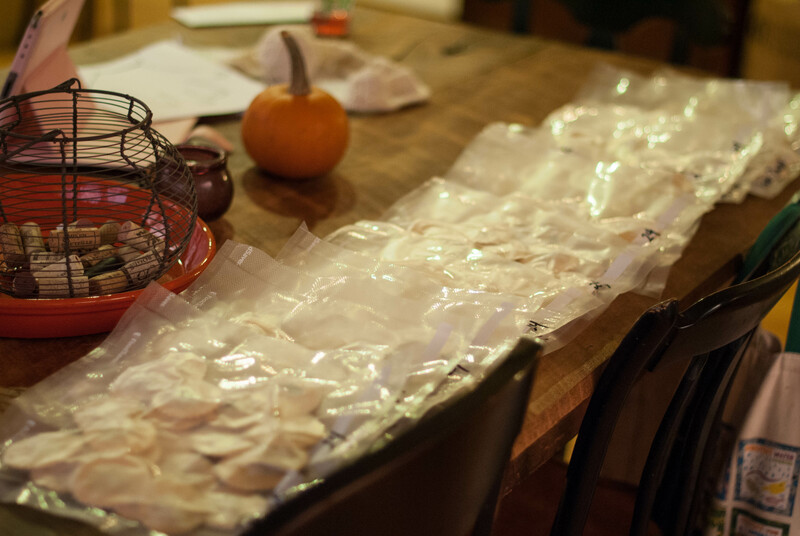 I’ve been getting so many I’ve taken to simply freezing them whole for later use in sauces. The big work has been the basil. It was starting to show signs of disliking the cooler temperatures at night and I decided it was time to harvest. I brought two big bushes worth and made pesto. I filled three Weck jars (2 half liter, one quarter liter) and got to work making pasta. 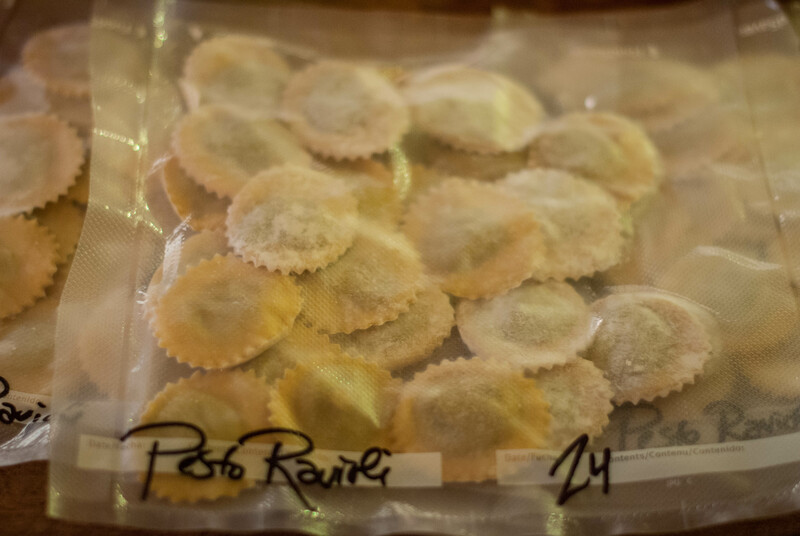 I ended up with 283 ravioli, distributed among 12 freezer bags. I would have broken 300, but Pippa stole about 20 off the counter when my back was turned. Jerk. 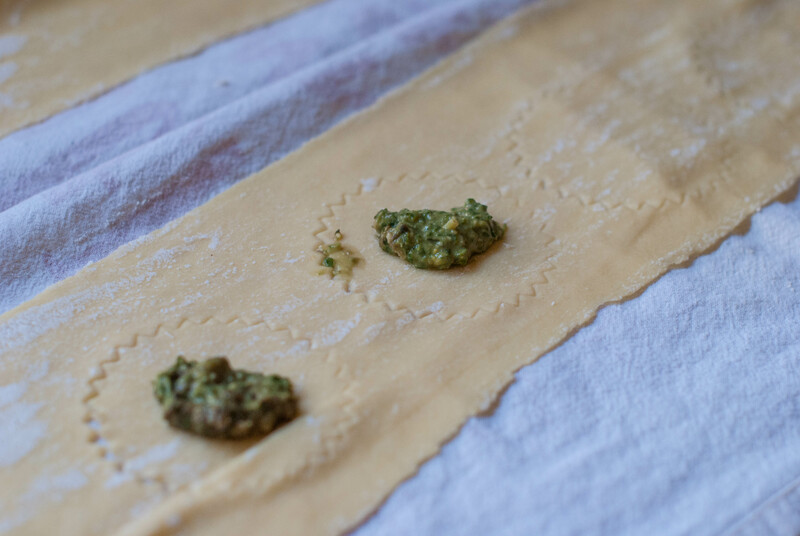 We love pesto ravioli, and this was an exciting sight for everyone when it was all done. 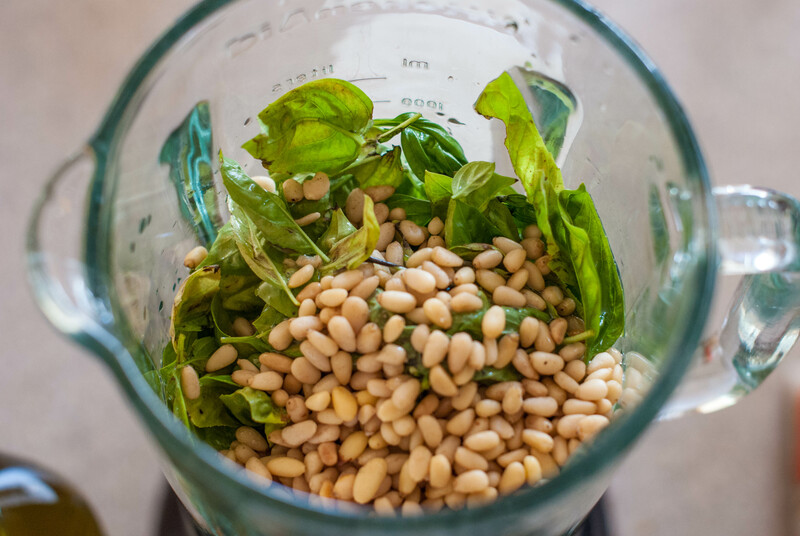 I still have another basil plant to harvest, and I can’t decide if I will make more pesto ravioli or if I will simply dry it for use as a seasoning. My friend gave me some very strong basil she grew and I made basil jelly with it. Very yummy on sandwiches and as an accompaniment for meat! Fun and easy to make. Jars didn’t need water bath processing.